The ProSplit provides one direct output and one transformer isolated output from a single microphone. Applications include sending the direct output to the main or Front-of-House mixer, with the second isolated output being sent to a monitor or recording mixer. The direct output passes phantom power from the main mixer to the microphone for use with condenser microphones. The ProSplit includes a ground-lift switch on the isolated output to reduce noise due to ground loops between connected equipment. For versatility the ProSplit also features an attenuator pad switch on the input that can be used to alternately connect a preamplified (line-level) signal to the two microphone-level ProSplit outputs. NOTE: All measurements made from TRANSFORMER ISOLATED MICROPHONE OUTPUT with PAD SWITCH out (off) and 150 Ohm balanced source feeding MICROPHONE INPUT and 1K Ohm load connected to TRANSFORMER ISOLATED MICROPHONE OUTPUT to simulate a typical "real world" microphone and mic preamplifier. 0 dBu = 0.7751/RMS. Connect low impedance dynamic or condenser microphone to MICROPHONE INPUT on the PRO Split. (Alternatively, connect line level signal to MICROPHONE INPUT and engage front panel INPUT PAD switch.) Connect DIRECT MICROPHONE OUTPUT to the mic input the on main mixer (switch phantom power on at mixer if desired). 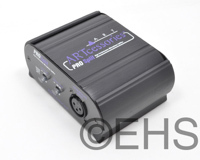 Connect TRANSFORMER ISOLATED MICROPHONE OUTPUT to the mic input on secondary mixer or recording system. Set GROUND switch to LIFT or GND. Use whichever setting provides lowest noise performance.